In this penultimate Universal Frankenstein movie, the studio adopts the kitchen sink approach, throwing the Frankenstein Monster, the Wolf Man, and Count Dracula into one titanic adventure. Just for good measure you also get a mad scientist and his hunchback assistant. The result is probably a lot better than it had any right to be, mainly because of the able scenery-chewing done by Boris Karloff as Gustav Niemann, the scientist bent on recreating Frankenstein’s most infamous experiment. If you’re wondering how all these monsters are able to share screen time, the simple answer is that they don’t. In fact, the movie is more like two mini-movies. The first movie details the escape of Dr. Niemann and his use of Count Dracula (John Carradine) in eluding a passel of angry villagers. The second movie is about what happens when Niemann comes home to Vasaria where the Monster and the Wolf Man still lie frozen in the ruins of the old castle from the end of Frankenstein Meets The Wolf Man. 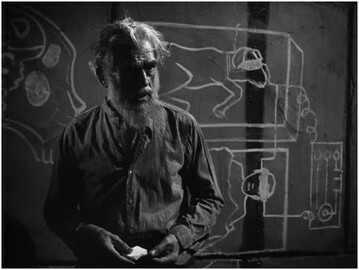 Dr. Niemann spends his time in jail shaking down guards for chalk and writing crazy formulas all over his prison walls. He dreams of doing Frankenstein’s experiments in creating life, but he dreams of doing it right. He and his hunchback pal Daniel take advantage of a thunderstorm to break out and they encounter the great Lampini. Lampini is a one man traveling house of horrors, carting around various scary souvenirs from hick town to hick town. The centerpiece of his collection is the skeleton of Count Dracula. Recognizing an evil business opportunity when he sees one, Nieman disposes of Lampini and restores Dracula to life so that he can kill some people for him. This all ends very badly for the Count when he gets involved in a horse and buggy chase through the countryside when the police realize what he’s up to. Niemann takes off, fearing that Dracula is going to lead the authorities to him. He also shows Dracula that no good deed goes unpunished when he has the hunchback dump Dracula’s coffin out the back of the wagon causing Dracula to wreck his buggy and go flying down an embankment. The sun comes up and the Count’s fate is sealed thus ending his brief stay in this movie. Niemann merrily rides off into the countryside. Next stop: the village of Frankenstein! Once in Frankenstein, they run into some gypsies and the hunchback saves a gypsy hussy from her pimp. Danny is sweet on her and she seems to be warm to him until she gets a gander at the big hump on his back. It’s pretty effective when Danny realizes that she’s just as shallow as you or I would be if a hunchback ever hit on us. Danny asks Niemann if he can fix his body so that he could be hunky instead of hunchy. Sure, sure, Niemann says, now let’s go find those monsters! Niemann hopes that the monsters might lead him to Frankenstein’s notes. Doesn’t anybody do any of their own work anymore? All these movies involve people trying to copy Henry’s homework. 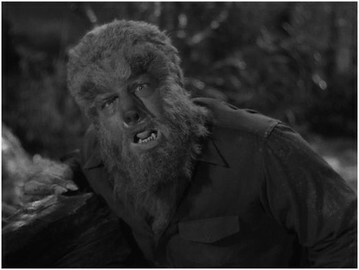 The Wolf Man and the Monster get thawed out and before the Monster’s ill-fitting sport coat can dry, Larry Talbot (Lon Chaney, Jr.) begins whining about his terrible fate. Because of the movie’s brief running time, Larry’s whining has to be fast and furious and every scene he has dialogue in contains either a complaint, a demand, or a plea, all accompanied by his hangdog face. The gypsy hussy is immediately attracted to him, since women find pouty cry-babies who turn into homicidal animals at night irresistible. This drives Danny nuts and gives the movie a layer that has been missing from the series – the love triangle! Do you love brain transplants? If so, your hypothalamus will positively throb with delight with what follows. Niemann kidnaps a couple of enemies and plans to put one of their brains into the Wolf Man so that he will know what it’s like to be a perpetual whiner. 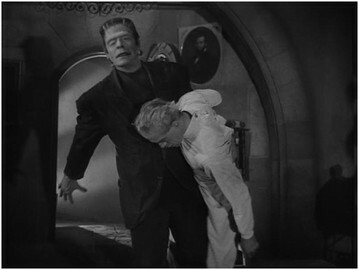 Then he’s going to transplant the Monster’s brain into the other dude for reasons that escape me. Somewhere along the line, the hunchback was under the impression that his brain was going to be transplanted into Larry Talbot, but that’s not going to happen and he gets mad and whips the Monster for some reason. Really, what could possibly go wrong? Except everything you could possibly imagine! 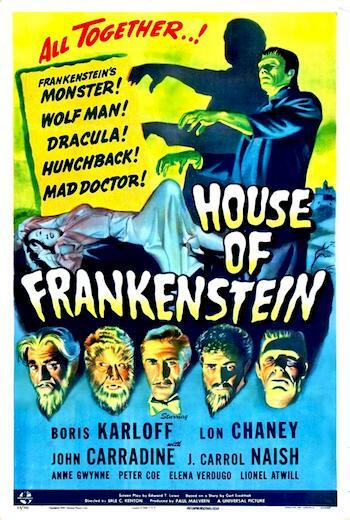 House of Frankenstein was as fun as Frankenstein Meets The Wolf Man was supposed to be. Karloff’s last run in the series highlights things, his performance a breath of fresh air. We finally get a mad scientist who is nuts to begin with, not some nerd who is only persuaded to go mad when the plot demands it! J. Carrol Naish is also very good as the much put upon hunchback and you actually feel some sympathy for a character for the first time in about four movies. Chaney and Glenn Strange as the Monster phone it in as you might expect, both creatures reduced to one note performances, eliciting yawns from the viewer as well as wishes that Carradine’s Dracula might have been around a little longer. Niemann’s complicated revenge scheme will make your head hurt if you try to sort it out and the fact that most of the characters from the first part of the movie simply disappear once the Dracula angle is finished give the movie an odd structure. It also demonstrates that it was no small feat to wring anything remotely entertaining from a series that at this time was in its sixth chapter. Still, this is probably the best of the last half of the series and certainly better than the finale that would follow, House of Dracula.